BEIJING -- China's political reform is the further improvement of its own socialist political system and the country can not mechanically copy the western political system, said top legislator Wu Bangguo Monday. China will actively draw on the fruits of the whole human civilization, including the beneficial achievements made in the political aspect, but "can by no means indiscriminately copy the western system", said Wu, chairman of the Standing Committee of the National People's Congress (NPC). 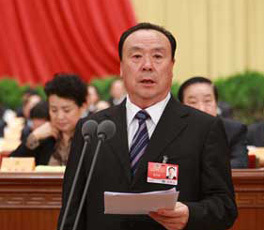 "(We) will never exercise multi-party ruling in turn, the separation of legislative, executive and judicial powers or the bicameral system," Wu said when delivering a work report of the NPC Standing Committee. China's political reform is the self improvement and development of the socialist political system including the NPC system, he said. An editorial of the People's Daily has called on China's top political advisory body to made due contributions to help the country weather through difficulties.